activities that build deep and enduring relationships. Games are marvellous for building strong families and friendships through positive interactions and shared experiences. Family Games Treasurehouse is packed full of hundreds of low-cost games, many of them free. A deck of cards or a handful of dice can provide hours of fun and entertainment. Parlor games, card games, dice games, word (spoken) games, pen and paper (written) games, tile (domino) games and board games are just some of the multitude of cheap games available on this site. Family game nights can be the highlight of the week for many families. 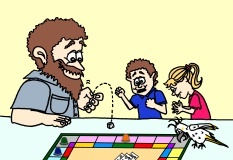 As well as trying many of the games from this website, some families like to play commercial board games, such as those available from Amazon and other retailers. Some games are simple enough for younger children to join in while others are more complicated and are better suited to adults and older children. Not all board games are suitable for families and some are not worth the money you pay for them. With our reviews, we play each game and check it out for suitability and value for money. Games that are unsuitable or are poor value do not get our approval because we do not want to recommend something that will disappoint our readers. However, we don't have the resources to review every game so we would like to encourage you to contribute your review of any family game that you own or have played. Simply go to our Share YOUR Game Review page and follow the instructions. If you want to try some fantastic new games, or renew acquaintances with some familiar old games, then check out these reviews. Cashflow - Do you want to be financially independent, no matter what your income? This game teaches the basic concepts of wealth creation in a fun and entertaining way. Monopoly - One of the classic board games that has lasted the test of time. Known as the "king of board games" for a very good reason. Family Trampoline - This review gives our family's experience in choosing the best type of trampoline for families. Volleyball Set - We love volleyball. It's such an interactive and fun game. This volleyball set review tells you what to look for when you are purchasing a family volleyball set. Table Tennis Table - Table Tennis is so much fun for all the family, but what do you look for when buying a good quality table? This Table Tennis table review will help you make an informed decision.